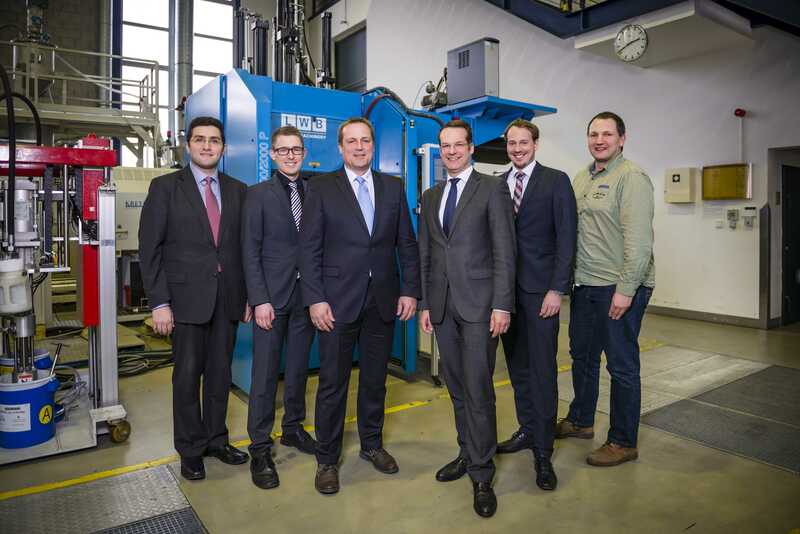 IKV has received a new vertical elastomer injection moulding machine from LWB Steinl GmbH & Co. KG, Altdorf. Peter Radosai, Head of Sales Europe, handed over the new machine in a ceremony at the IKV development plant. 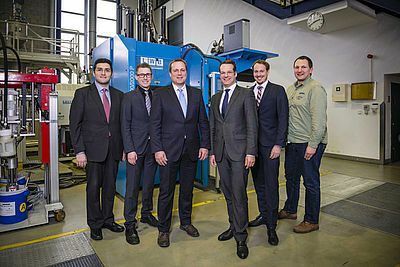 The IKV Institute of Plastics Processing at RWTH Aachen University has received a new vertical elastomer injection moulding machine of type VSEFE 3000/2000/330 b Performance from LWB Steinl GmbH & Co. KG, Altdorf. Peter Radosai, Head of Sales Europe, handed over the new machine in a ceremony at the IKV development plant. The EF-E injection unit (LWB Stein’s designation) represents the state-of-the-art in the field of injection technology. It combines the positive properties of the first-in, first-out (FIFO) principle of an EF injection unit with a fully-emptying E system. A clear reduction in heating time can also be achieved through the multi-stage control of the dissipative injection energy performed by the rapid cure element fitted between the EF and the E systems. The machine has a clamping force of 2825 kN and can deliver a maximum injection volume of 2000 ccm. The IKV’s research programme includes innovative approaches to optimum process control aimed at offsetting material-conditioned batch fluctuations. In the field of special injection moulding processes, this new machine is being used to conduct investigations into the projectile injection technique using black rubber. The general aim of research work at IKV is to investigate and overcome the challenges associated with machinery, processes and tools in the production of elastomer parts.